Shop from now until May 8, 2016 at Charming Charlie store locations in the U.S. or Charming Charlie online and save money! You can take $5 off your purchase when you spend over $15. Or, take $25 off your purchase of $75 or more. 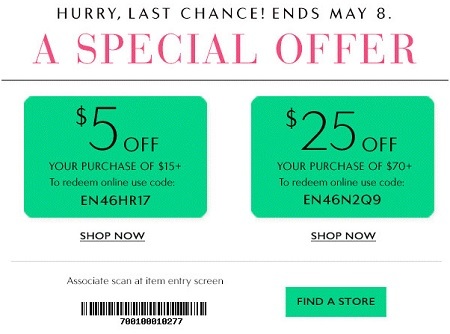 To redeem online use promo code which is avaiable through Charming Charlie emailing, in-store coupon use for purchases at at Charming Charlie store locations (also available through Charming Charlie emailing). Offer expires May 8, 2016. Source of the information is Charming Charlie. For more information about this promotion visit your nearest U.S. store location or official website.